Earlier this year, Kiss announced they'd head out on tour across the world one final time. The mammoth End Of The Road tour will kick off at the end of January, with close to 70 shows already booked across North America, Europe, the UK and Russia, with more expected to be announced in due course. Many bands have headed out on their ‘final’ tours in the past, only to scrap those plans and keep going. But Kiss guitarist Tommy Thayer insists this it definitely the last chance fans will have to see the band. 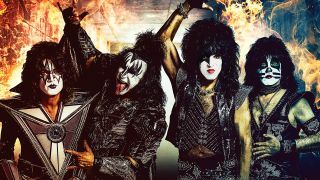 The guitarist tells Russian website Tass.com: “Gene Simmons, Paul Stanley, Eric Singer and myself, we decided that while the band is still very good and we are doing the best shows in the history of the band, that we wanted to go out when we’re in top form and do a final tour. When Kiss announced their intentions to rock the world one last time, they issued a statement saying: “All that we have built and all that we have conquered over the past four decades could never have happened without the millions of people worldwide who've filled clubs, arenas and stadiums over those years. "Kiss Army, we're saying goodbye on our final tour with our biggest show yet and we'll go out the same way we came in... unapologetic and unstoppable." Find a list of all confirmed End Of The Road dates below.